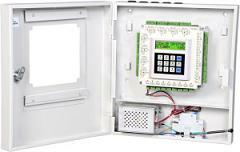 InstaID series ACT1000 is a four door access controller. It has a robust design and easy mechanism for effortless installation. It can simultaneously control & monitor up to four doors thus reducing the per door cost. It can be connected with any kind of readers viz; Finger Print, Mifare, Proximity and supports either industry standard configurable weigand or clock/data interfaces. It is imperative for areas like R&D labs and server rooms. 4 Door / 8 Reader Controller: Supports access control of up to 4 doors in all respect including 4 entry readers, 4 exit readers, 4 locks, 4 exit switches etc.